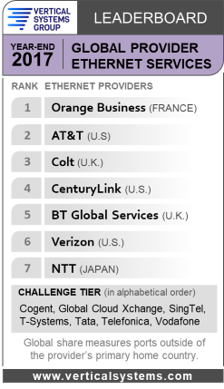 France’s Orange remained first while AT&T improved its position to second place in Vertical Systems Group’s (VSG) newly released 2017 Global Ethernet Leaderboard report. UK’s Colt was third while CenturyLink made its first appearance in the rankings finishing in fourth place. VSG said slim margins separated the leaders. VSG also noted that the Global provider Leaderboard companies that have received MEF 3.0 certification are AT&T, Colt, CenturyLink and Verizon. Challenge tier companies attaining the distinction are SingTel, T-Systems, Tata, Telefonica and Vodafone. Last month, VSG said that CenturyLink, AT&T, Verizon, Spectrum Enterprise, Comcast, Windstream and Cox were, in that order, the top finishers in the U.S. Ethernet Leaderboard last year. The results are noteworthy because it was the first time since 2005 that AT&T did not finish as the leading provider.